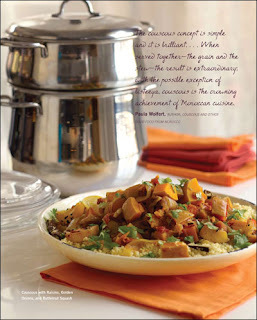 Here, a simple vegetable stew of butternut squash and onions is spooned atop couscous flavored with cinnamon and dotted with raisins. 1. In a wide 3-quart saucepan or sauté pan, combine 2 cups of the broth, cinnamon stick, and raisins, and bring to a boil. Decrease the heat to low, cover, and simmer for 5 minutes. Add the couscous and stir to blend. Remove from the heat and let stand for 10 minutes. Uncover and cool for 10 minutes. Combine ½ cup of water and 1 teaspoon of salt in a small bowl and stir to dissolve. Sprinkle the salted water on the couscous while simultaneously raking it with your fingers to break up the lumps. Let stand, uncovered, until ready to finish cooking. 2. Add the oil to the bottom section of the couscoussière, a Dutch oven, or 5-quart sauté pan. Heat the olive oil over medium low heat until hot enough to sizzle a piece of onion. Add the onions and cook, stirring, over low heat, for 15 to 20 minutes, or until the onions are golden brown. Add the squash and cook, stirring, until coated with the oil. Sprinkle with the ras el hanout, 1 teaspooon of salt, and the cayenne, and stir to blend. Add the remaining 2 cups of the chicken broth and the tomatoes and heat over low heat while preparing the top section of the couscousière. 3. If using a couscoussière, lightly butter the inside of the top section and set it on top of the bottom section holding the squash mixture. Cut a length of cheesecloth long enough to go around the rim of the bottom section with a slight overlap. Dampen the cheesecloth with water, squeeze dry, and sprinkle lightly with flour. Fold the cheesecloth into a 2-inch-wide band, and wrap the band around the rim between the top and bottom sections to seal the seam so no steam escapes. 4. Bring the stew in the bottom half of the couscoussière to a boil over medium heat. When the steam begins to rise through the perforations, add about one-half of the couscous in a layer. Then spoon the remaining couscous on top, piling it into a pyramid. Steam, uncovered, over medium-low heat, for 15 minutes. 6. While the couscous is cooling, continue to cook the stew over medium-low heat for 10 minutes. 7. Return half of the couscous to the top of the couscoussière and spread in a layer. Then spoon the remaining couscous on top, piling into a pyramid. Steam the couscous while simultaneously continuing to cook the stew over low heat in the bottom portion for 10 to 15 minutes. Lift off the top portion and taste the stew and add salt, if needed. 8. Spoon the couscous onto a deep platter or shallow serving bowl. Make a well in the center and spoon the squash and its juices into the center. Sprinkle with the cilantro and add the preserved lemons or lemon wedges. Serve and pass the harissa at the table to be added to taste. You can steam the couscous the first time several hours before serving. Let it stand, covered with a damp towel, and then spoon it back into the couscoussière to warm just before serving.